Possibly the worst email subject line ever written is “Following up”. What this really means is: “I’m writing to you because I want your money.” This self-serving subject line tells your prospect that you’re more interested in your sale and less interested in adding value to the prospect’s problem. I’m going to give you a much better email template that you can use later in this article. No matter how much you want to make a sale, the reality is that people will buy when they’re ready to buy, not when you’re ready to sell. You can fight that reality and keep sending sales-based (or follow up) emails but ultimately the reality will win and you will lose. Worse, you won’t just lose the prospects who are reading your annoying emails. The effect multiplies because as people delete emails without reading them or press the ‘spam’ button out of frustration, your future emails are less likely to enter the Inbox and instead will likely go to the Promotions Tab or Spam Folder. A much better approach is to forget the sale. Yes, FORGET SELLING. Just help your prospect. Instead of thinking of it as a follow-up email, think of it as an add-value email. 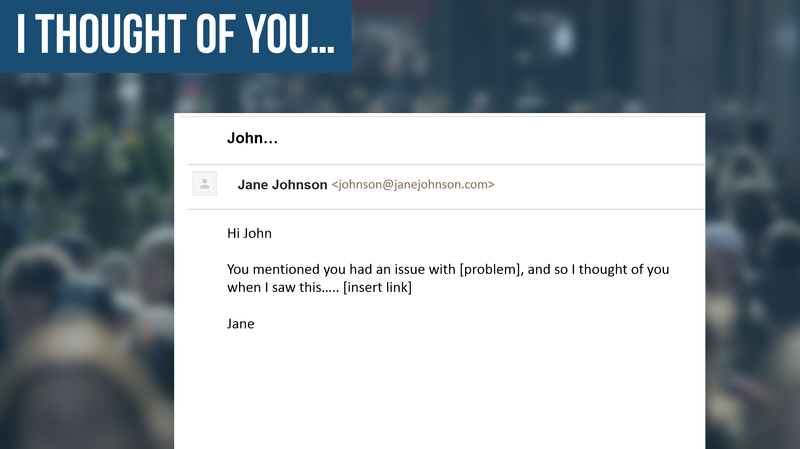 In this vein, a subject line with “I thought of you…” shows that you care. It shows that the recipient of your message is not just a number, but a person with real needs. When your prospect is ready to buy, he or she will appreciate all the great things you’ve done and let you know. Imagine making sales without having to sell. That’s what happens when you take a value-based approach to your emails, instead of a sales-based approach. To move from a sales-based approach to a value-based approach, you need to forget about closing the sale and more about how to make your marketing more valuable to the point that there isn’t a trace of selling that can be detected. You then need to come up with useful content for your prospect. And that begins by deeply understanding your customers’ specific challenges. The mistake that many marketers make is that they talk in general terms. Real agents, for example, tell us they have a ‘unique opportunity’. We’ve heard this phrase so many times that it has lost its meaning. This equally applies to phrases like ‘how to get more sales’, ‘how to generate more leads’ and so on. How can your customer get people interested in something other than a quote? Is your customer getting any feedback on the quote, and if so, what is it? What exactly is your customer putting in that quote? When you’re communicating with your customers, you want to be talking about specific scenarios, not general problems and vague ideas. Another way to think of it is this: Could your message apply to any person, or just the recipient you’re currently targeting? If it could apply to anyone, then you’re probably not adding much value. This is why if you are sending a message to a group of people, dynamic content is particularly important. 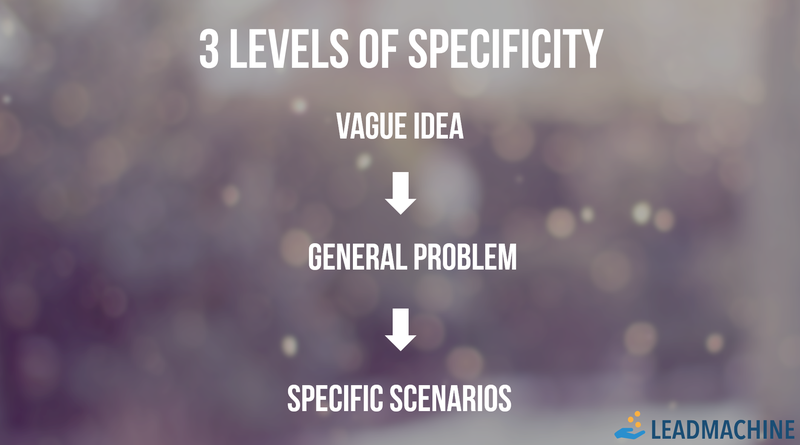 Ultimately, you want to get to the point that you are so specific that you give your prospects more clarity about their problem than they have ever had before. You then automatically become the solution. Your prospect is shocked that you understand the problem so well, the natural assumption is that you must have the solution. You are perceived as an authority on the subject and the sale follows easily from there. I want to send you the most useful content in my emails that’s possible. So, can you please reply to tell me: What is the single biggest challenge you are facing in relation to [your business]? You could even email them to ask them to click a link to schedule a time with you with scheduling software like timetrade or schedule once. If you have a basic idea of what your recipients’ challenges might be, you can try sending an email that says something to the effect of “I want to send you email that is most useful to you… so please select one link below so I only send you relevant content” and then offer 3 links, one for each topic. Then you send different emails to people based on the link which they have clicked. You mentioned that you were experiencing [describe challenge in detail]…. So I thought you’d like to know that we have an event in your local area in the next few weeks. Use timing to your advantage. Let’s say you’re a provider of prenatal yoga services. You can send out varying emails depending on where your recipients are at in their pregnancies, so that, for example, a message you send to someone in her first trimester differs significantly from a message you send to someone in her last month. Another way to engage your customers and keep the conversation going is to send out news or updates specifically related to them. If you have important customers or want to keep tabs on news related to certain topics, you can use Google alerts to help you out. Let’s say one of your customers is an up and coming motivational speaker. If you set up a Google alert and find out that he’s quoted in an article, you can send an email that says “I saw you mentioned on [Article Name],” which would make him feel important and increase your chances of getting a response. Similarly, Newsle is a service that provides information on everyone on LinkedIn and Facebook every time they are mentioned in a major online publication. This gives the added bonus of creating a situation where you can contact customers to say that you saw they were mentioned. It makes them feel good that they are being noticed and means that you can respond directly to their situation. There’s a very clever Dove commercial that you’ve got to watch…. As you can see, the ad brilliantly demonstrates that with all the styling and photoshopping, amazing models don’t even look anything like themselves. Dove successfully creates an enemy – the impossible pursuit of perfect beauty. The consumer is left feeling that the only option is to pursue their natural beauty and it just so happens that Dove sells products for this very purpose. This video educates and only when you understand the message do you realize that Dove must be the solution. Dove never needed to mention their products in the ad. There’s also no 10% discount if you buy by next Tuesday. Similarly, your emails need to be focused on real problems that your prospects are facing. Help them solve these problems and you will find that purchasing your product is the natural outcome.